Christopher has been fascinated by the ancient world since the age of four, when he saw an exhibition of objects from Pompeii. That led (some time later) to a Ph.D. in Classics, looking at the interaction between religion and philosophy in sixth century BC Greece. Christopher has a particular interest in understanding how people make sense of the world, whether through religion, philosophy, story-telling, art or architecture. He has lectured in Classics at Melbourne, Monash and La Trobe universities and was an Honorary Fellow at the University of Melbourne’s School of Historical and Philosophical Studies from 2004 to 2017. 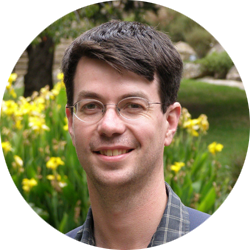 In 2002, Christopher set up the University of Melbourne’s popular Classics Summer School and ran it for 15 years. In 2018 he began teaching with the Hellenic Museum Summer School (www.hellenic.org.au/summer-school). Christopher’s summer schools provide short courses on ancient Greece and Rome for the general public each January. Participants particularly enjoy his relaxed but enthusiastic and thought-provoking style and the summer school have become an annual fixture for many people. Christopher has also been involved with some less traditional means of bringing the ancient world alive for modern audiences. He was an academic advisor for the Hellenic Museum’s Retrial of Socrates, which featured prominent barristers arguing about Socrates’ guilt before a panel of Supreme Court and County Court judges. He worked on the ABC’s award-winning website Winged Sandals, which brings ancient myths to life for modern children. A highlight of that for Christopher was developing an interactive recreation of the Delphic oracle. He also runs regular Socratic discussion groups, where people use the techniques of the ancient philosopher Socrates to discuss modern issues. Christopher has been leading the tour An Adriatic Journey: from Trieste to Dubrovnik since 2016. In 2020, he leads ASA’s tour to Greece entitled A Journey through Minoan Crete, Mycenaean Greece and the Classical World. Christopher first joined ASA in 2016.